Day-glow painting. Photo by Jack Mader. Come visit the garden of our minds as we bring what’s inside out, and invite the outside in. Vine Arts Center has been growing Art on the Greenway since 2007. Surprises abound at the Ivy Building for the Arts for Northern Spark 2014. Celebrating our city’s great biking culture, we are collaborating for the third year with the Midtown Greenway Coalition in their Greenway Glow ride. Relax with some campfire cooking, watching cloud projections, and illuminated Art bikes as they cruse along the Midtown Greenway. 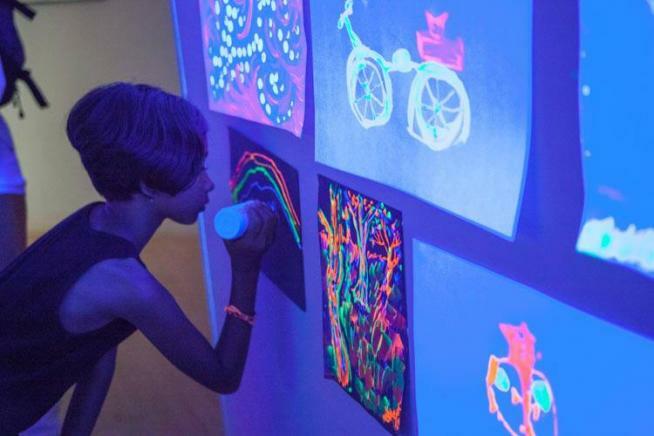 Make your own glow in the dark painting in our black-light gallery. In the main gallery, Vine Arts member celebrate Northern Spark in a multimedia exhibit. Fun for all—guaranteed.